Yankees' Jeter Says 2014 Season Will Be His Last : The Two-Way "I want to start by saying thank you," New York Yankees shortstop Derek Jeter tells fans. The idea of Jeter retiring from pro ball has been a subject of debate in recent years, driven in part by his age and a nagging ankle injury. 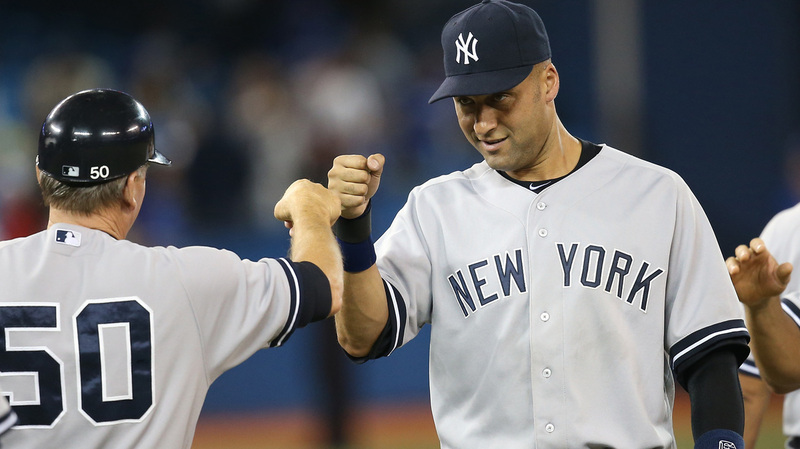 Derek Jeter says the upcoming baseball season will be his last. Jeter has played his entire career with the New York Yankees. "I want to start by saying thank you," New York Yankees shortstop Derek Jeter tells fans on his Facebook page, starting a note that should quell the wide speculation about Jeter's future in baseball. He will retire after this season, he said. "I could not be more sure. I know it in my heart," Jeter wrote. "The 2014 season will be my last year playing professional baseball." The idea of Jeter retiring from pro ball has been a subject of debate in recent years, driven in part by his age (39), a nagging ankle injury – and also by this question: If Derek Jeter can't be satisfied with the career he's had, what would it take? Jeter will have one more year to answer that question — and to put a better ending on his career than would have come after the 2013 season, which saw the shortstop play in only 17 games due to injury. "Since his championship rookie season of 1996, Derek has represented all the best of the national pastime on and off the field. He is one of the most accomplished and memorable players of his — or any — era. "Derek is the kind of person that generations have emulated proudly, and he remains an exemplary face of our sport. Major League Baseball looks forward to celebrating his remarkable career throughout the 2014 season." Since his major league debut in 1995, Jeter's accolades include being named Rookie of the Year and the MVP of both a World Series and an All-Star Game. He also won five World Series rings and posted a .303 batting average in 33 postseason series from 1996 to 2012. Those are the highlights of a long and full career that many regard as a modern standard for professionalism and performance. Even in the glare of New York's media spotlight, Jeter avoided controversies and was a steady presence in his team's dugout. Jeter has also had an uncanny knack for making clutch plays at the plate, on the base-paths and in the field that proved to be the difference in tight games. "From the time I was kid, my dream was always very vivid and it never changed: I was going to be the shortstop for the NY Yankees. It started as an empty canvas more than 20 years ago, and now that I look at it, it's almost complete. In a million years, I wouldn't have believed just how beautiful it would become." Playing his entire career with the Yankees, Jeter is the franchise's' all-time career leader in hits, with 3,316, and at bats, with 10,614. He has tallied more than 200 hits in seven different season, most recently in 2012, with 216. We imagine clubhouses around the major leagues are silently thanking Jeter for his early warning, so they can prepare the tributes and gifts that he's sure to receive before he leaves baseball and heads toward an eventual date with the Hall of Fame.